You are here: Home / In General / Reunion At Sherman & Co.
Reunion At Sherman & Co.
Two former associates returned for a visit last week. 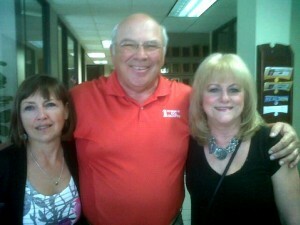 Dian Youngblood, now of Lee’s Summit, Mo., dropped by along with Debbie Keech, now of San Antonio. Dian was down to visit long time friend, Jerry Halpin (Sherman & Co. retired agent), her best friend Debbie, and her brother who resides in Austin. Dian reported that winters can be challenging in her new home; but, the first snow of the season is always welcomed and seems “so beautiful.” Debbie’s husband, Bill, works for United airlines and they they leave Thursday, March 29, for Spokane, WA., where Bill will begin his new assignment as General Manager of ground operations at the Spokane airport for United. Laughs could heard throughout the office as both looked great and seemed in the best of spirts.